・　In the study, the team analyzed more than 77,000 cases of thyroid cancer documented in a National Cancer Institute (NCI) database between 1974 and 2013. Along with the tripling in cases over that period, the researchers noted that between 1994 and 2013, cases of advanced forms of thyroid cancer rose by about 3 percent each year, and deaths from the disease rose by about 1 percent each year. ・　In the period from 1974 to 1977, there were 4.6 cases of thyroid cancer per 100,000 people diagnosed yearly in the U.S. That number reached 14.4 cases per 100,000 people yearly in the period from 2010 to 2013. ・　"Certain environmental pollutants could be a factor since we're receiving so much exposure to chemicals that could be endocrine-disruptive," Kitahara said. ・　In the study, the team analyzed more than 77,000 cases of thyroid cancer documented in a National Cancer Institute (NCI) database between 1974 and 2013. 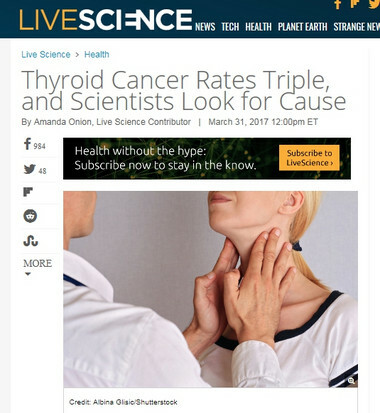 Along with the tripling in cases over that period, the researchers noted that between 1994 and 2013, cases of advanced forms of thyroid cancer rose by about 3 percent each year, and deaths from the disease rose by about 1 percent each year.In the period from 1974 to 1977, there were 4.6 cases of thyroid cancer per 100,000 people diagnosed yearly in the U.S. That number reached 14.4 cases per 100,000 people yearly in the period from 2010 to 2013.